Despite the lingering warm weather, it’s nearly October which means time for pumpkins, the leaves to turn, and all of the delicious cozy dishes that autumn has to offer. Sweet potatoes are a fall favorite in our family (make that a year-round favorite! ), and so last night I decided to bake a batch of Gwyneth’s sweet potato & five spice muffins. 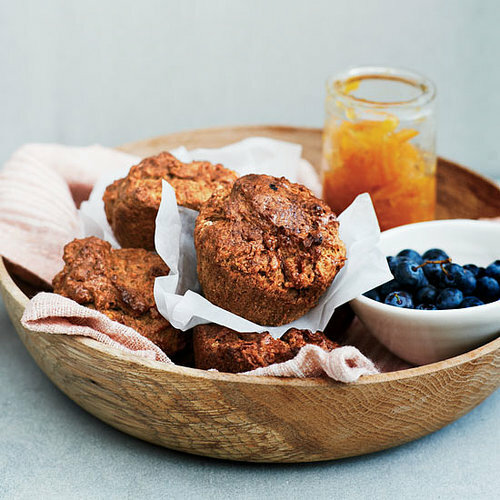 As healthy as they are tasty, we each enjoyed a muffin for breakfast this morning, and savored every last golden crumb. A hint of sweetness from the maple syrup combined with fabulous depth of flavor from the aromatic spices makes for the perfect combination, and one I think you will truly enjoy. Also, if you have yet to experience the culinary masterpiece that is “It’s All Good,” I recommend you pick up a copy today – there are so many wonderful recipes! Preheat the oven to 400ºF. Prick the sweet potato a few times with a paring knife or a fork. Bake about 1 hour. Set the sweet potato aside until it’s completely cool. Peel the sweet potato, discard the skin, and mash the flesh in a mixing bowl with a fork. Whisk the olive oil, almond milk, maple syrup, and vanilla into the sweet potato. In a separate bowl, whisk together the flour, baking powder, baking soda, five-spice powder, and salt. Fold the dry ingredients into the wet ingredients. Line a 12-cup muffin tin with paper liners and evenly distribute the muffin batter among the cups. Bake for 20- 25 minutes, or until a toothpick comes out clean.